Nowadays people under the age of 20 are unfamiliar with buying music in a physical format. It’s all MP3 or streaming but there are still independent music retailers who have weathered the technological storm and are still trading, Piccadilly Records is one of them. Being a native Mancunian I spent a lot of cash & time in the eighties & nineties in this shop and fondly remember when they were based at Piccadilly Plaza in town before it moved to Brown Street. I bought many discs covering Post-Punk, Factory, Indie-Pop, Goth, 4AD etc etc…At one time there was even a Piccadilly Box Office (a tiny booth in store) where you could buy concert tickets! They are still going strong today, situated on Oldham Street, in Manchester’s Northern Quarter, which is in my opinion the last remaining piece of the city centre retaining any sort of architectural character and identity. If you were to visit the said Quarter on what’s known as ‘Record Store Day’, Piccadilly will be responsible for the hundreds of eager collectors & e-bay floggers queuing round the (Eastern) bloc waiting to get their hands on new & exclusive releases! Unearthed in the Lake District this Sparta commemorates PR’s 30th Anniversary. 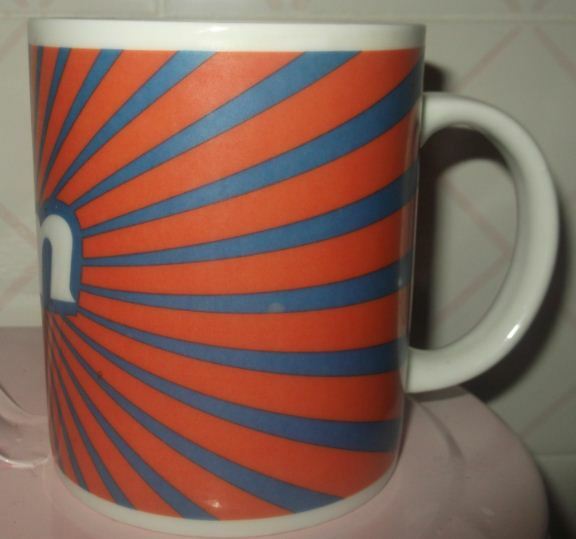 Maths isn’t my strong suite but if they were founded in 1978, if you add 30 to that, then this mug dates back to 2008. I particularly like the use of a 45RPM single adaptor to replace the zero in “30”. 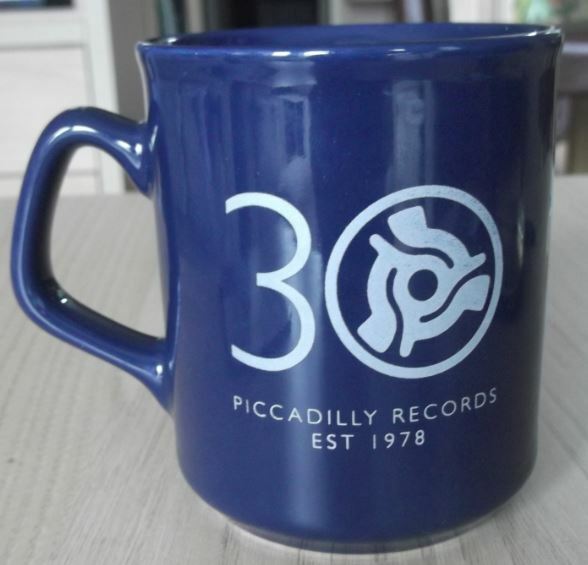 Anyway, here I am pop-pickers waxing lyrical over music and shopping habits of my youth but I’m aware this mug fires up the old ‘Novelty’ versus (Rough) ‘Trade’ debate but Spotters who’ve been with us since the early days recall my controversial ‘Spillers’ post of yore, so it seemed only appropriate to welcome Piccadilly Records to our annals. We’re not messing about here. Their website is a smorgasbord of consumables, peripherals and office products. 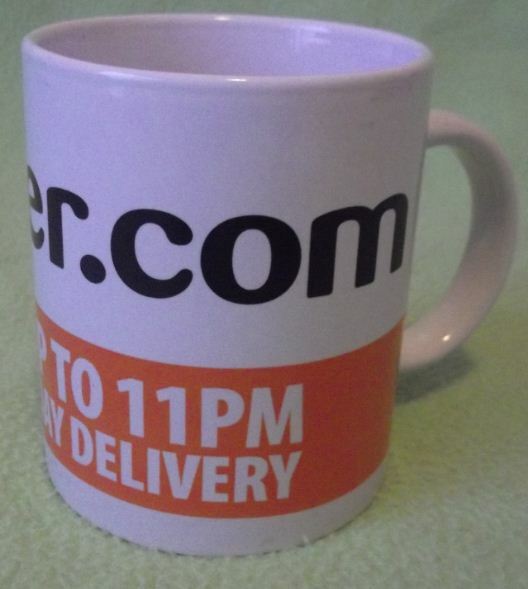 As their trade mug says, ‘Order before 11pm for next day delivery’. Even the mighty NEXT will only go as far as 9pm so you know you’re onto a good thing. And what an e-catching Cambridge it is. Monster font sizes abound and neat economical design make the most of its humble 2-colour origins. Finally it’s nicely framed with a smart white-on-orange slug around its base. 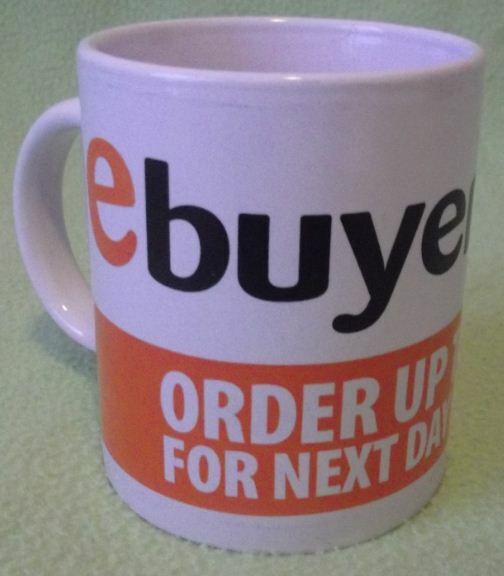 “Ebuyer.com is one of the largest Internet resellers of brand name computer technology and consumer electronics products. Founded in 1999, Ebuyer.com is headquartered in Howden, East Yorkshire. Employing over 300 employees, we service 3 million registered customers. Anyway, what are you waiting for? It’s not 11pm yet? Get ordering. Banzai-style action with this “up & atcha” Cambridge courtesy of thrift shop chain, B & M Bargains. 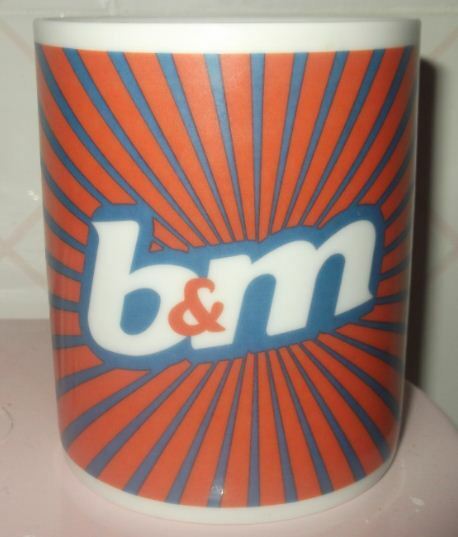 The Blue & Orange rays scream at you with the B&M logo smack-bang on the front of the mug. In-yer-face! At least it brings a little sunshine into this dank, dark & cold January! But I say, God bless ‘em. If you have the time & patience shopping at outlets such as these can save you lots of money when compared to Supermarkets. Wow. That’s Booker Prize stuff! They do look to have a website but it’s view only. You have to hit the high street or retail parks to grab your bargains. Getting back to retail, the only other growth area on the High Street are Charity Shops, which incidentally was where I snared this mug. Ironically it was only 30p, which is 70p cheaper than if I’d got it if from a ‘Pound’ shop. – Glossop Caravans – although native Glossopians (Pronounced Gloss-oap-ians) argue it’s not actually IN Glossop and hey are just using the name of the town to generate interest. I’m not sure but they have an almighty logo! And what a curio it is. Small in stature and with its ‘tight’ handle it cuts the figure of a mid-size Sheraton. 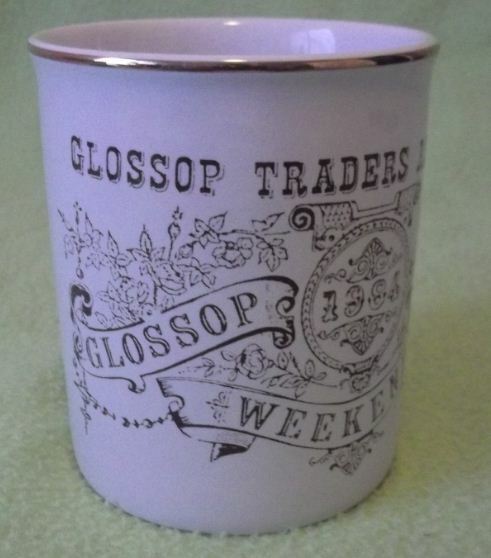 It’s produced to commemorate or promote Glossop Market Traders hosting a Victorian Weekend (in 1984? but the caligraphy is so bad I can’t tell), which I thought was pretty much like every weekend spent there! Gold leaf adorns the rim and print work sits slantedly to one side of the mug, leaving the other side cruelly exposed. Novelty or Trade? I’m not 100% sure but here it is. 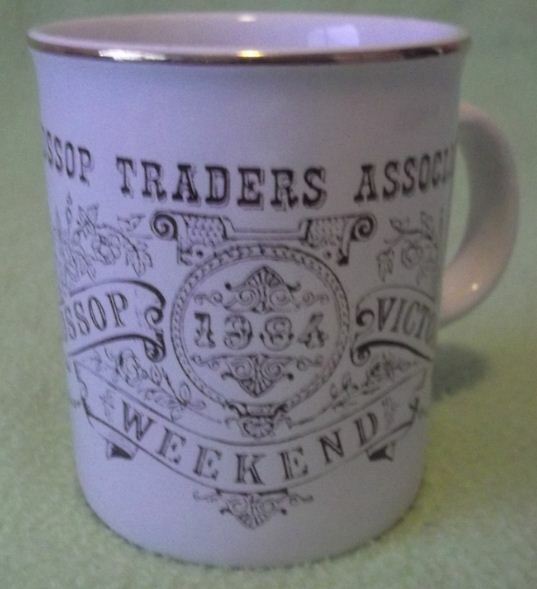 Here we have a trade mug advertising a gift shop found in a charity shop….go figure. This a solid, stocky little Newbury courtesy of on-line nick-nack & objet d’art peddlers, The Alphabet Store. Their website offers “The A-Z of every gift you need, but can never find” plus it’s own mug section featuring a set of ‘men-hating’ earthenware. However moving on, they also sell a fine line in Text Speak Mugs, my favourite being OMG which all Spotters know stands for Oh Mugs, Great! 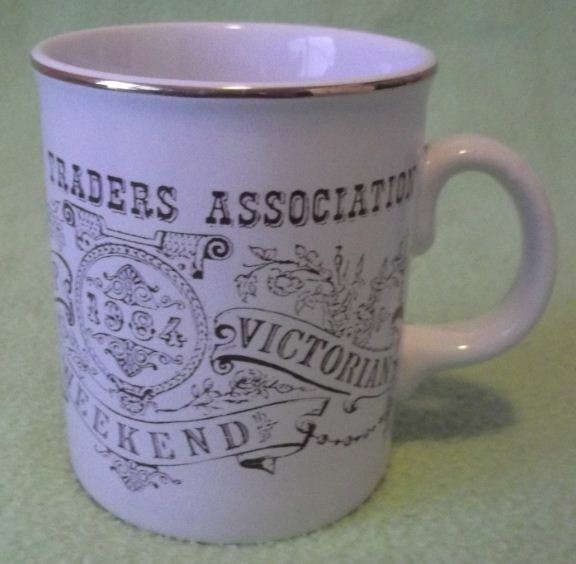 Ironically despite them selling the A-Z of Everything, what I couldn’t see for sale was an “A-Z Alphabet Store Mug”! You have to rummage round Tewkesburys finest Charity Shops for those. Digging the Monty Pythonesque Logo. PS. If anyone can come up with any more ‘hilarious’ (& clean) Mug-related’ Text Speak acronyms, please post them in the comments. I’d love to hear from you. 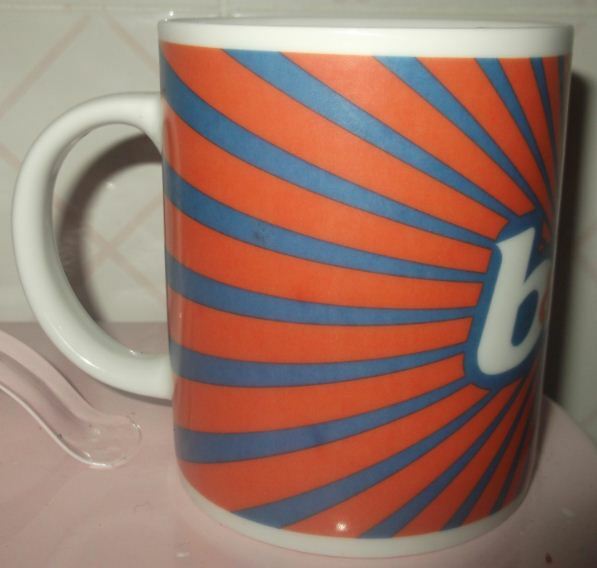 ….It’s an M & S Mug. 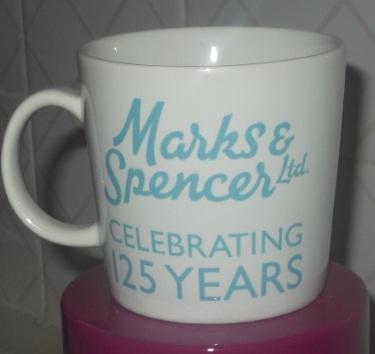 M & S ran a ‘Penny Bazaar’ event and this mug most likely would have been produced to advertise this. The mug itself is a curious specimin. It’s breed occupies a space somewhere between Deco & Atlantic and of course we have the olde-worlde typography in a nice ‘Citeh’ Blue but it’s a small affair indeed. I think we’ve been here before on this blog!